Couch to Gower Bike Ride - Join Us! This year’s Gower Bike Ride takes place on Sunday 21st July. Here at Swansea University, we’re showing our support for this iconic event by organising a series of practice rides, designed to help build your confidence on two wheels and get you Gower Bike Ride-Ready. Our practice rides will be led by our team of Swansea University Ride Leaders; a friendly group of budding cyclists, just like you! You can read more about our Ride Leadership programme and what it’s all about over on our travel webpages. If you’d like to get involved in any of our practice rides, regardless of whether you intend to take part in the main event or not, come along and join our fantastic team of Ride Leaders. All you need to do is sign up to the ride(s) over on the letsride.co.uk website. Everyone is welcome; staff, students and the local community, and nobody gets left behind. You’ll notice on the letsride.co.uk website that some of our practice ride routes are suitable for any type of bike, including our Santander Cycles. So, if you don’t have your own bike, you can still take part. 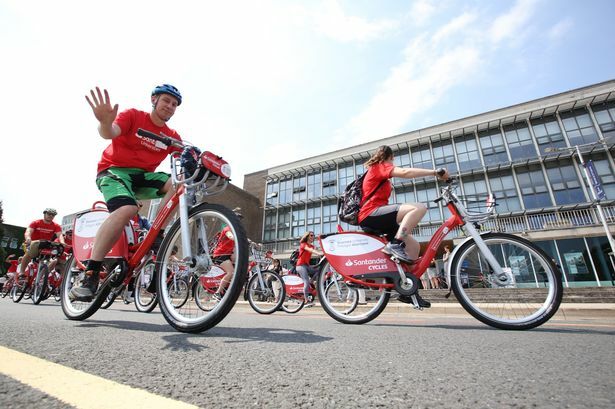 Our Santander Cycles are conveniently located at 5 docking stations across the sweep of Swansea Bay, including both of our campuses. Annual membership for students of Swansea University is just £30 – that’s half the price of a standard annual membership. You can find out everything you need to know about Santander Cycles over on the scheme website. If you have any questions relating to our practice rides, the Ride Leadership scheme, or Satander Cycles, please get in touch with Jayne Cornelius by emailing j.cornelius@swansea.ac.uk. She’d be very happy to answer any queries you might have. We look forward to seeing you at our Couch to Gower Bike Ride practice events! Save 1/3rd on ALL Bus Travel in Wales! Important Changes to Uni Bus Services 8 and 8X Meet the team Signing for a house Residents room swap TerraCycle Stationery Recycling Programme Do I need a TV Licence? Residents surgeries Need someone to talk to? Using the mobile app to do your washing! Budgeting brilliance this year Need some support? Volunteering & Internships: A-Z Staying Safe / Security at Swansea University If you were a dog, which would you be?